Stories from St. Michael’s – Tell my story. I’ve been in Pensacola since Sunday night, and it has been nonstop research heaven. It has been a great trip so far; I’ve found a lot of new information, made new friends, and I feel a lot more confident about how this project is coming along. When you work alone on a project, it is easy to let the isolation get to you. Not many folks up in Maryland know what I’m doing (outside of my university colleagues), nor do they really care about West Florida history from the early 1900s. But, the folks down here do, thank you very much, and everyone I’ve met has been helpful. Today, I walked all over St. Michael’s Cemetery with my friend Nancy, who has been a tremendous help with the research this week. We were in search of Minnie Kehoe and/or any other Kehoe family members, and friends of Emmett’s who were buried here. We didn’t have a map, which might have expedited things. 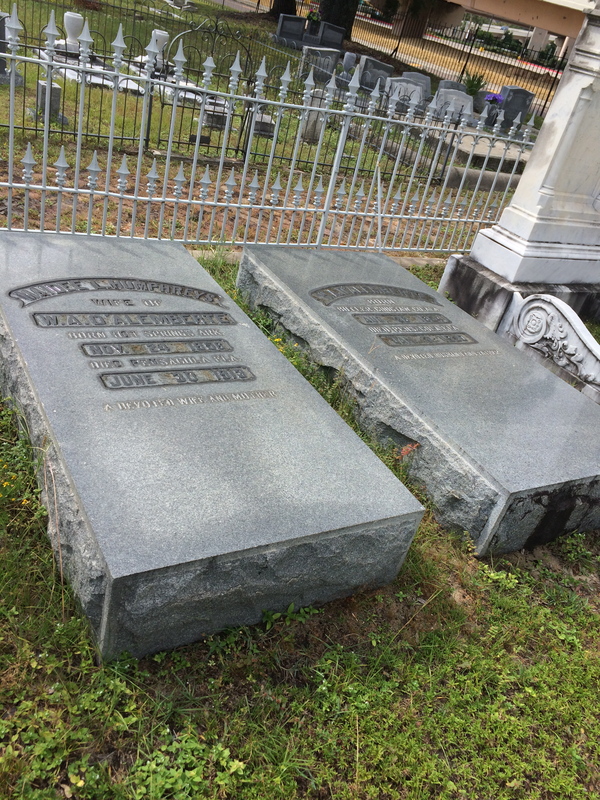 But, because we like to walk around in cemeteries and meet the folks there, we struck out to see what we could see. Martin & Kate Sullivan. Martin was a railroad and timber capitalist. Born in Ireland, died in Baltimore, buried here. Emmett definitely knew the Sullivans. 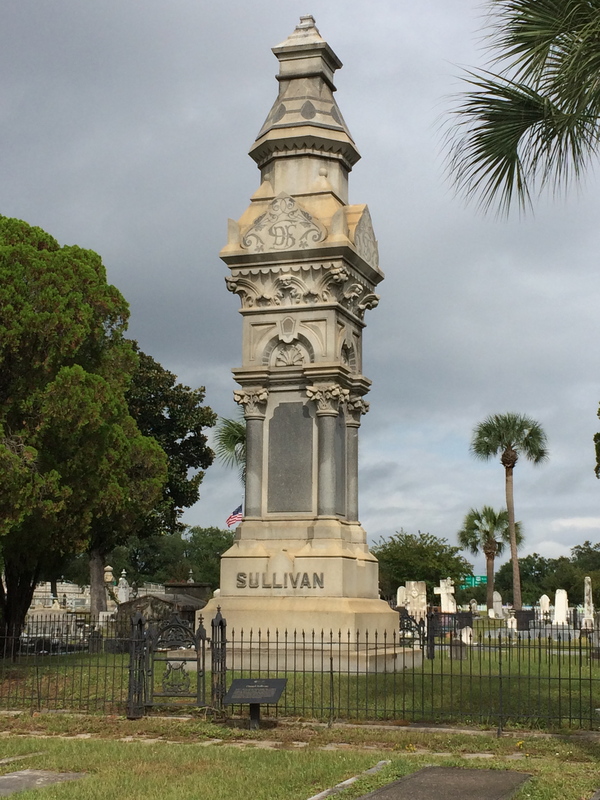 A son is buried here, too, who was only about 25 years old when he died. Martin and Charles (the son) died only a month apart in 1911. 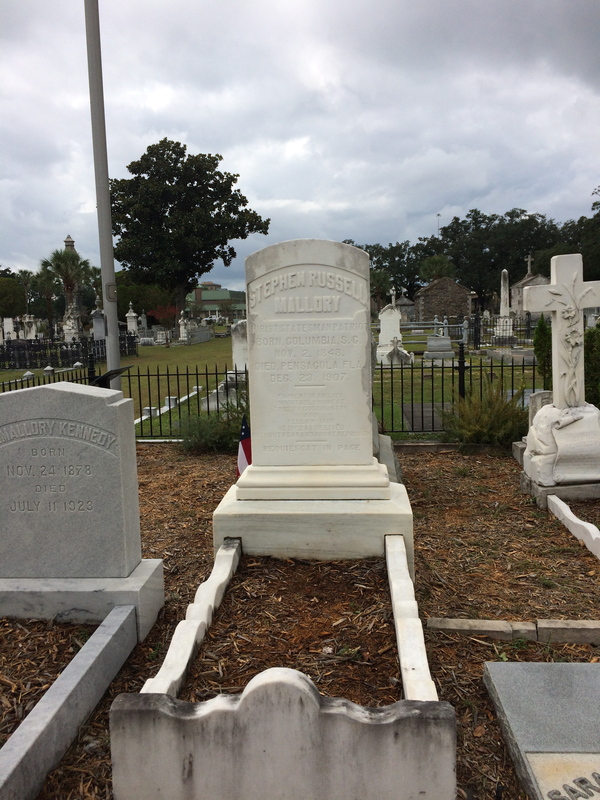 This is Daniel F. Sullivan, who ‘gave Pensacola the First National Bank and the Opera House, according to the Daily Register of Mobile, Alabama. He died in 1884. 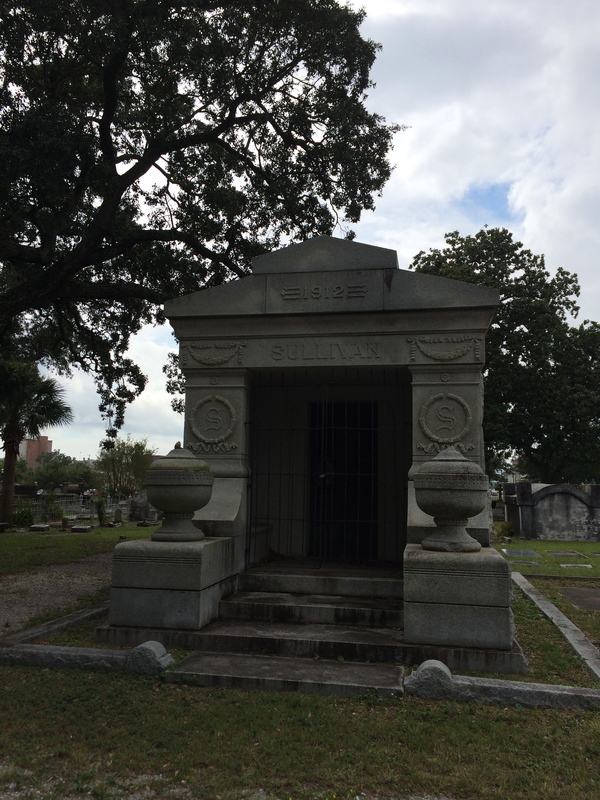 It isn’t stated clearly if he is related to the other Sullivans of the masoleum, but he was also big into timber, and originally from Ireland. They could be related. I haven’t determined it yet. As noted, some of the residents are more famous than others; the stones tell interesting stories. 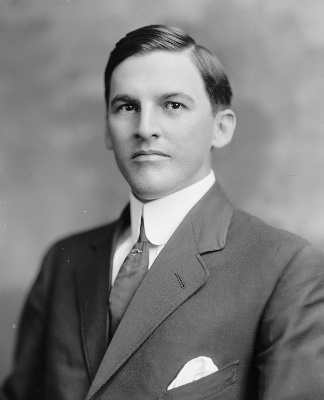 Stephen Russell Mallory was Emmett’s grandfather’s law partner. Emmett’s grandfather was A.E. Maxwell (buried at St. John’s only a few rows up from Emmett). You can’t see it in this photo but directly to the left of me was a huge rosemary bush. In fact, someone planted rosemary within the Mallory enclosure. I’d like to do that for Emmett’s grave, but you cannot (it will get cut down). W.A. and Maidee D’Alemberte. W.A. (aka “Willoughby”) was the father of one of Emmett’s good friends, J. H. D’Alemberte. He was a druggist. There is an interesting story about his life here. Emmett was rather close to J.H. (aka “Herron”); he went on vacations with them, hung out with them. Herron was one of Emmett’s good friends. Tragically, Herron committed suicide in the 1930s; the family said it had to do with significant losses in the stock market. Herron is buried in Temple Beth-El Cemetery. Owen Miner Avery. 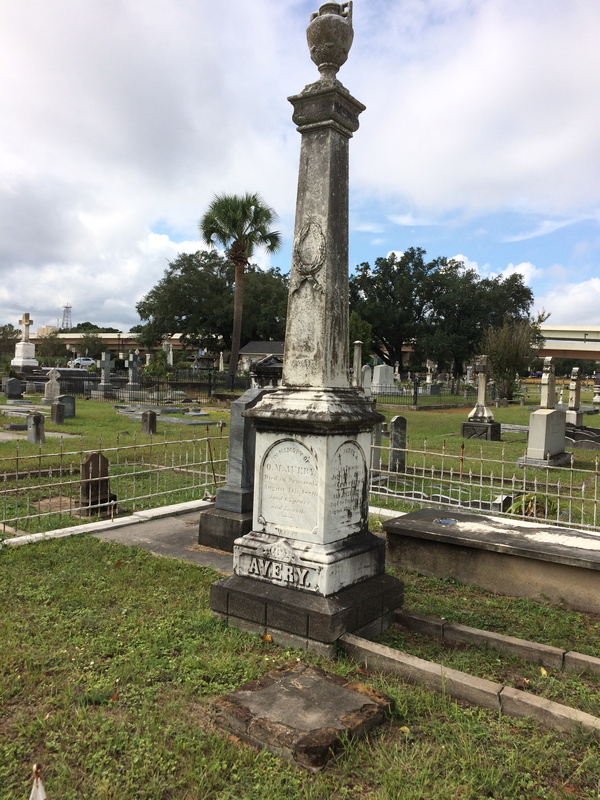 Another prominent Pensacola family, the Averys. Emmett socialized with them often. Owen was a more senior relative. I’m headed to Chipley this morning to spend time with friends, and then, to Marianna the next day for more research, so, I have to stop here for the moment. I’ll post more details about the trek through St. Michael’s Cemetery a little later. It was a great trek! I did find Minnie — and a few more interesting folks and stories to share. It’s great to be back in Pensacola!